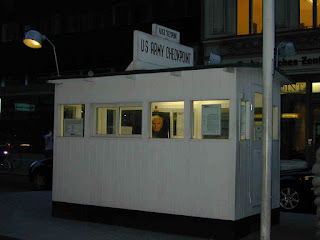 The Doctor Atlantis Show: Check Point Charlie Ghost? Nah. Check Point Charlie Ghost? Nah. On Richard Wiseman's blog a photo showed up today. 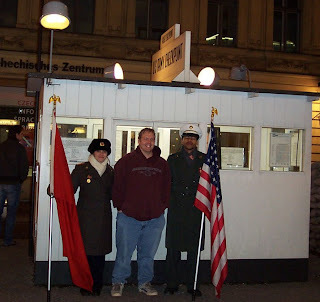 Checkpoint Charlie Ghost. Could that be a ghost in the window? Meh. Looks like a photo in the window to me, so I did what any self-respecting skeptic would do... Namely I wasted 10 minutes doing Google image searches until I found a similar photo from the same place which gave me the answer. With a little enlargement you can see that there is in fact a dark-background photo in the window of both pictures. Without the blur it just appears to be a portrait photo. It may even be the same guard (actor?) in the photo - it's a little blurry to be certain. But that's no ghost. Just a big photograph in a photograph. Who's the dude in the photo? 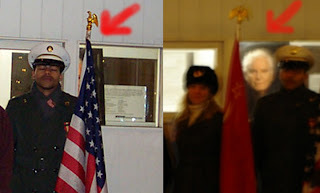 I'm GUESSING that it is Rainer Hildebrandt, former head of the museum at the Checkpoint Charlie site. To be sure, I wrote the museum and asked - we'll see. Thank you for your email from April 28, 2009. 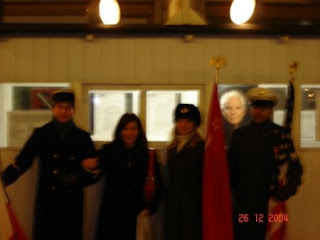 Yes, the painting in the guard house shows Dr. Rainer Hildebrandt, the founder of the Mauermuseum – Museum am Checkpoint Charlie.